Helping students to “learn how to learn” is crucial for understanding and becoming a life-long learner. 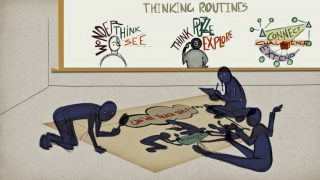 To discover how aware students are of their thinking at different ages, it is necessary and really helpful to build “cultures of thinking.” The theory behind is that if educators can make thinking more visible, and help students develop routines around thinking, then their thinking about everything will deepen. One example of this for this is the Harvard Medical School, where …….